13 Split biomes into their own pages? 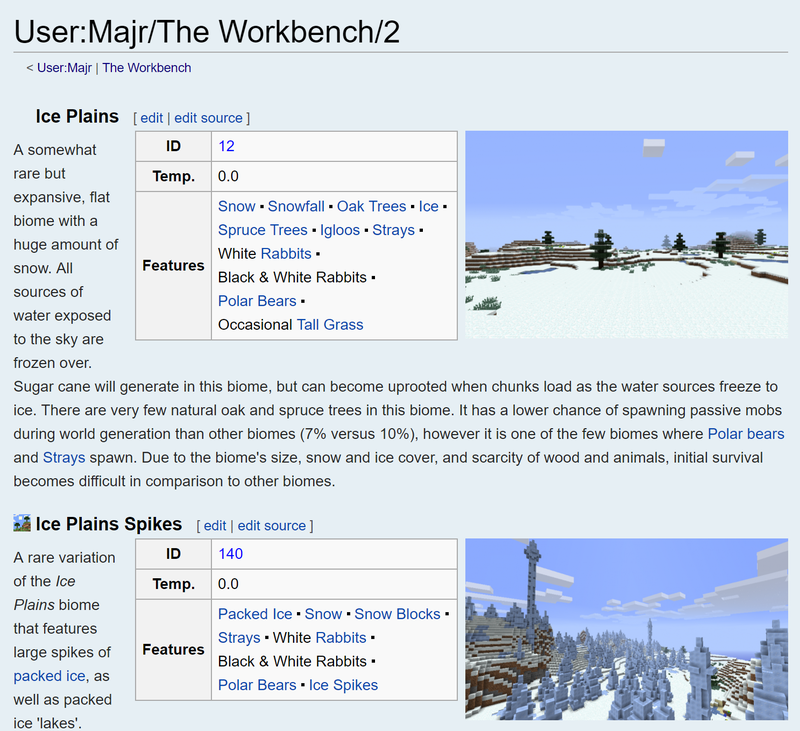 19 Reorganise description of variant biomes in the each of the individual biome pages? Is there any info for the levels at which flower's will grow at? Like is there a minimum and maximum height or will they grow from bedrock to build limit? Flowers can exist in levels 1–255. Using bone meal on a grass block, you're only limited by where grass can exist with a free space above it. And during world generation, the biome decorator is able to put flowers at any of those same levels. Under Biome Types > Neutral, "Redwood Taiga Hills" should be "Redwood Taiga Hills M". Also, Plains M is unobtainable through both customized and superflat worlds, defaulting to Ocean - basically, they've been removed from the game. Since Plains M has been removed like it should've a while ago, the note on how many biomes there are near the top of the page needs to be edited as well. I also thought that it could redundantly add the number of actually obtainable biomes in a normal world, which is three less than the total. I have to disagree. The tables already have a loads of empty space on single line descriptions, the only real difference is it being broken up by the text being right in the centre of it, which we could probably still do if that is the issue. In fact the only increase in empty space is ~40px, half of which comes from the header having its own line. If we could find a way to pull the floating content to be inline with the header, the height of each "row" would only be ~20px higher. Ultimately, the design looks to me much more readable on smaller screens (including desktop), while wasting a small amount of space on large screens. Seems like a net win. Split biomes into their own pages? As I have been exploring some seeds, I noticed that some Plains biomes are much more hilly and has a darker green tint to them. From what I can tell, these are Plains M biomes and I even found one that is directly next to a Sunflower Plain. It's strange that the Plain is not turning into a Sunflower Plain when mutated but instead, turns into a Plains M biome. Since this biome exists and is still around in Bedrock Edition, perhaps a Bedrock exclusive entry should be made for it? Edit: After studying this Plains M biome, it appears the grass color matches the color of a normal Forest Biome so it may have a similar temperature to a Forest Biome. In addition, I noticed that the Plains M biome has no foliage except for small patches of Dandelions. Not even Tall Grass nor Trees will spawn in a Plains M biome. The height of a Plains M biome seems to match the same height as the non-mutated Extreme Hills Biome next to it. Very interesting. Changes I made: - Updated total number of biomes: "There are 64 biomes in the overworld, one in the Nether, five in the End and 3 unused biomes, bringing the total number to 73 different biomes. - Fixed Frozen River: the page states that it generates through all cold biomes, and that it usually leads to frozen ocean, but it actually generates only through Snowy Tundra biome and has nothing to do with the nearby ocean (land biomes behave differently than ocean biomes). - Fixed Frozen Ocean: it is not necessarily generated when a cold biome meets the ocean. - Fixed Deep Frozen Ocean: the page says that a layer of ice is generated at the surface; that's only true for its shallow counterpart. - Expanded Deep Warm Ocean: specify that coral reefs and sea pickles aren't generated in this biome (check in-game if you didn't know!) and changed "Warm Deep" for "Deep Warm". - Updated Mountain Edge: specify that this biome isn't naturally generated since 1.7.2. 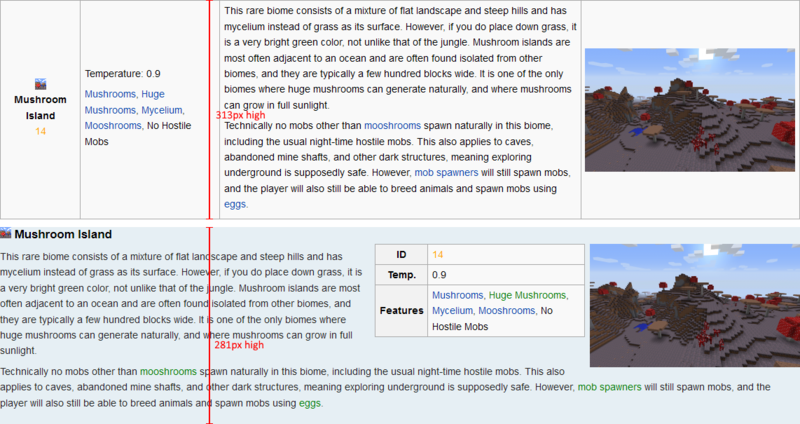 Reorganise description of variant biomes in the each of the individual biome pages? 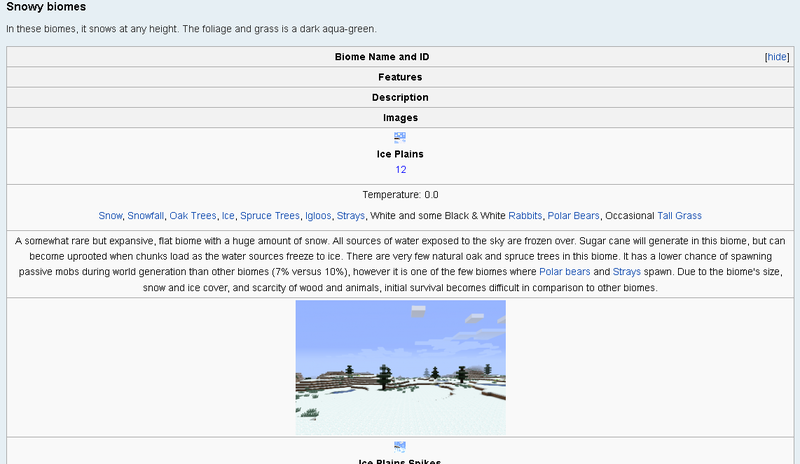 Currently, the seperate pages for each of the ‘biome families’ are laid out with a small summary of the main biome at the top of the page, followed by a ‘description’ and then the variant biomes, each with their own summaries. I think it would be more clear to have an overall summary of the entire biome family at the top, and then have the ‘main biome’ put under ‘variants’ along with all the other members of the biome family. This would help prevent confusion as to whether the ‘description’ section is only about the main biome (since the main biome is currently separated from its other variants on the page) or the entire family as a whole, and would also give more equal representation for each individual variant of the family. Put your arm over the bottom of the screen so that the grass isn't visible. You can barely see a difference at e.g. the top of the sky, though it is very subtle. To give seeds to each biome. But seeds are dependent on editions. To leave a sentence about the Buffet mode. But this is Java Edition exclusive. To not give any way to explore at all (keep the page as-is). In my opinion, the third option makes it fun to discover a biome. People just still need to get used to the new names, just like when hardened clay was renamed to terracotta. This page was last edited on 20 February 2019, at 21:21.